NOTE: Be sure to download the accompanying reference guide upon purchasing. You'll need it to go through the audio. If you can't access it, just contact us directly at audio@instantseries.com. 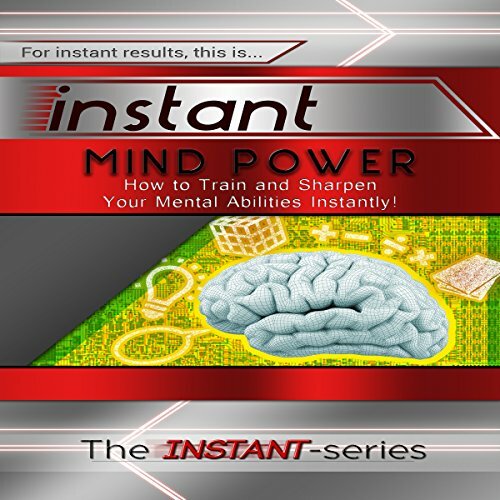 The Instant-Series Presents Instant Mind Power: How to Train and Sharpen Your Mental Abilities Instantly! Your mind is a superhuman computer. It houses all your cognitive abilities: concentration, memory, awareness, reasoning, perception, etc. It's the command center that controls your entire being. It's your very existence. Your mind is who you are. The capacity of limitless human potential and what your own mind can do for you are unfathomable. Scientists have proven that the more you use certain areas of your brain - like for learning - it increases neural pathways comprised of neuron brain cells to build stronger and newer connections that are the makeup of our intelligence, making it easier to assimilate and process information faster, like a supercomputer. Thus you can upgrade your mind to be smarter through mental training, mind exercises, and even fun brain games. How to perform a simple mind hack to process information then retrieve them from your memory bank, like a recorded movie scene with every detail intact. How to rewire your mind with the mental numbing technique to suppress your sensitivity to nonessential stimuli and give you unstoppable laser focus. How to practice channeling your thoughts at an instant snap whenever you need to, so you have mastery control over whatever it is you want your mind to do instead of it controlling you.